A 14 metre, offshore-capable, game fishing catamaran design will be presented at this year’s Auckland On Water Boat Show. The boundary-pushing design is a collaboration between Kit Carlier Design and Stimson Yacht Design, who will exhibit together for the first time at the late September show. Capable of 30knots and handling offshore conditions, the game fisher has been designed to offer a combination of speed, length and capability not found in the production marketplace. 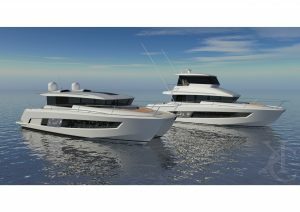 Models come in sedan, open and enclosed flybridge variants and were inspired by feedback the two design houses received from keen game fishers who wanted a vessel to handle big seas at speed. Where many production catamarans on the market present 20-25knot top speeds, with round bilge semi-displacement hulls making them uncomfortable in open water at speed, Stimson and Carlier’s design offers 25-30knots with a planing hull form. The asymmetrical deep V delivers comfort at speed offshore, while reduced displacement from semi-custom composite production, using infused panels, means the design is aimed firmly at serious game fishers. “After several enquiries for this type of vessel, Christian and I decided to create a concept that was extremely versatile yet used a common and proven platform. By using some uncomplicated build methods, the composite cored construction will allow for the vessel to be adjusted to suit almost any client requirements from length and beam through to internal and external layout while providing an economical build cost,” says Carlier. The asymmetrical, deep V hull and primary structure are designed to be built from CNC cut flat panels, saving both weight and tooling costs. The collaboration saw designer Carlier craft the interior layout and exterior lines, while naval architect Stimson produced the hull, powering/performance and flat panel kit. Originally from the UK, Auckland based Stimson, FRINA, has 30 year’s design experience in a wide variety of vessels, from challenging superyacht tenders to performance sailing yachts and launches in all corners of the globe. A background in performance racing yachts led to him joining the senior design team for the British America’s Cup challenge in 2003, and that passion for efficiency still underpins his design work. Carlier prides himself on his ability to create concepts and visualise technically how they will need to be developed to become a successful product. He draws from his vast experience during 20 years in the marine industry and is always looking for new opportunities to leave his mark. Meet Kit Carlier Design and Stimson Yacht Design at stand 331 (Pavillion 3) at the Auckland On Water Boat Show this year, for full details on this muscular, performance-driven game fisher.